In the third period of Game 6 of the Eastern Conference Final, as the Washington Capitals faced elimination, the team needed someone to make a play. Though the Capitals led 1-0, the Tampa Bay Lightning were pressing for the tying goal that would have deflated the nervous fans in Capital One Arena. It could have been the beginning of the end of the Capitals’ longest playoff run of the Ovechkin era. Then someone made a play. It was not Alex Ovechkin, this generation’s greatest goal scorer. It was not Evgeny Kuznetsov, who recently set the Capitals’ franchise record for points in a postseason. It was rookie forward Chandler Stephenson. Since the Capitals drafted him in the third round of the 2012 NHL Entry Draft, Stephenson has spent the better part of three seasons with the Capitals’ AHL affiliate, the Hershey Bears. Even during the 2017-18 regular season, Stephenson was often a healthy scratch as the Capitals’ bottom six became a bit of a carousel. Despite a resume that was less than illustrious going into the postseason, Stephenson has become an energetic, dependable, and dynamic fixture in the Capitals’ lineup throughout the team’s current run. With two goals and five assists, Stephenson’s postseason point totals are somewhat unimpressive, albeit solid for someone who was expected to play bottom six minutes going into the playoffs. More impressive is the context in which Stephenson has earned a few of these points. Two key Stephenson plays loom large as major reasons the Capitals are still battling for the Cup. Stephenson’s first career playoff goal came in the third period as the Capitals were attempting to eliminate the Columbus Blue Jackets. Down 4-2 early in the third period, the Blue Jackets had the opportunity to trim the lead to one on the power play and launch a comeback effort. That was until Stephenson slid the puck underneath Columbus goaltender Sergei Bobrovsky’s five-hole on a shorthanded breakaway, putting the Capitals up 5-2 and allowing them to cruise to a 6-3 victory and a 4-2 elimination of Columbus. Stephenson had officially arrived on the playoff scene. This time, Stephenson helped the Capitals avoid elimination. Midway through the third period, with the Capitals leading 1-0 and weathering a flurry from the Tampa Bay Lightning, Stephenson used his speed to outrace Lightning defenseman Braydon Coburn and negate an icing call. He then received the puck behind the goal line, and delivered a backhand pass to the tape of Devante Smith-Pelly in front of the net. Smith-Pelly wasted no time, putting the puck past Tampa Bay goaltender Andrei Vasilevskiy and putting the Capitals up 2-0. This proved to put the game out of reach for the Lightning, as the Capitals went on to win 3-0 and force a Game 7. Though Stephenson has not put up an overwhelming amount of points, he has made tremendous individual efforts in season-defining games. Over the course of the postseason, Stephenson has played on every Capitals line. He has flanked Kuznetsov and Ovechkin on the Capitals’ top scoring line. He has played alongside Jay Beagle on the Capitals’ more defensive fourth line. Perhaps most impressively, despite playing most of the season as a winger, Stephenson filled in as Washington’s third-line center while Nicklas Backstrom missed four games with a hand injury. The Capitals went 3-1 in those games. Washington has seen its share of lineup instability this postseason. Tom Wilson’s three-game suspension along with injuries that sidelined Backstrom and Burakovsky for multiple games have forced Capitals head coach Barry Trotz to juggle lines on multiple occasions. Stephenson’s ability to play anywhere in the lineup has helped the Capitals maintain a balanced attack even when key players have been unable to participate. As the playoffs have gone on, Stephenson has gone from a promising up-and-comer to a mainstay in the lineup that can handle a wide variety of responsibilities. However, after this postseason run, Stephenson’s role with the Capitals may become a bit more consistent. With the potential departure of pending unrestricted free agent Jay Beagle, some have suggested Stephenson will replace Beagle as the Capitals’ fourth line center. 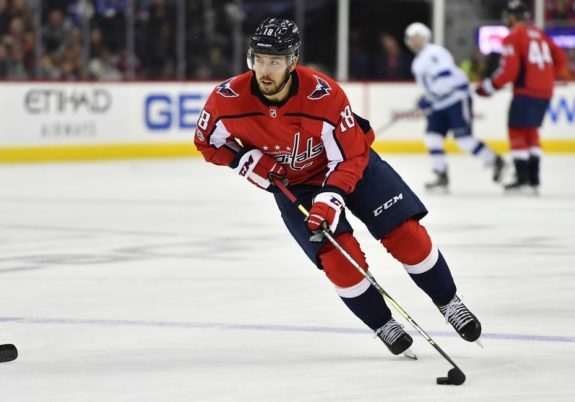 Beagle has become a fan favorite in Washington for exhibiting many of the qualities Stephenson has displayed this postseason. Media, fans, teammates, and coaches have lauded both players for their dependability, relentlessness, and multi-faceted contributions to the team. If the Capitals fail to re-sign Beagle, Stephenson, who played center for most of his time in Hershey, could be an ideal replacement. It may depend on if Washington wants to give Stephenson fourth line usage or carve out a larger role for him higher in the lineup. 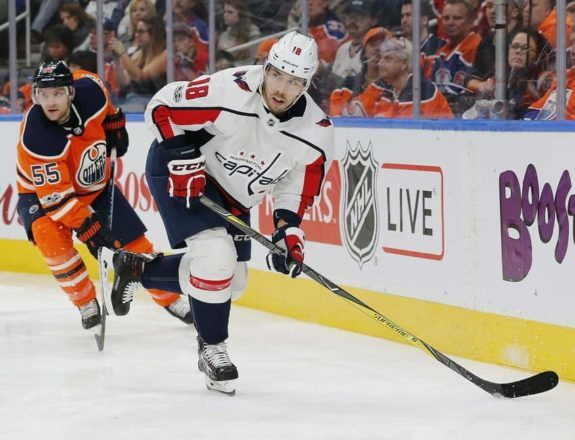 Regardless of where he ends up moving forward, in Stephenson, the Capitals have found an effective forward who will play a vital role in the team’s current run and beyond.